total control of what their pool will look like. 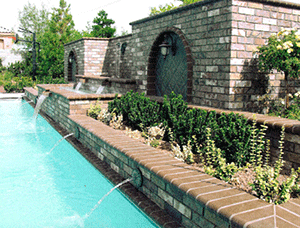 This type of pool consists of a rebar framework sprayed over a mixture of sand and concrete. Our team of experts can create practically any shape. 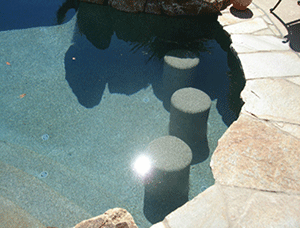 If you want to have a custom built-in pool and spa, a gunite pool will be the right pick. One reason people choose gunite pools is because you can make a variety of shapes and sizes, not to mention install different finishes to create any type of swimming pool. It’s not just about the shape of the pool itself, but even the sides and bottom. For example, you can opt for a beach entry bottom that gently slopes down as it gets deeper, just like a regular beach. This is particularly advantageous for older users of the swimming pool, as well as children and those with mobility problems. You can also add different water features like fountains, water bowls, deck jets, as well as real stone grottos and waterfalls. You can even add mood lighting in certain locations. Despite its flexibility, another reason is that gunite is also very durable and can last a very long time. 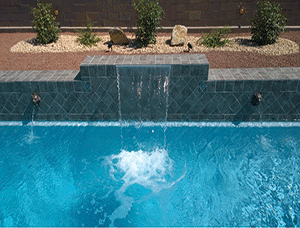 A custom swimming pool can also have a custom built in spa. We have many clients who asked us to install a custom spa and they have been happy with our work. Gunite pools do have their disadvantages. For example, these can cost more than fiberglass pool. It takes longer to design and make a gunite pool, plus additional labor to get it finished. That also means it takes more time to complete the project, anywhere between four to eight weeks. This is a project that has many steps, plus there are some factors and variables that may come into play during construction.